Lack of common sense is truly an incurable disease, as well as its certain form named russophilia. 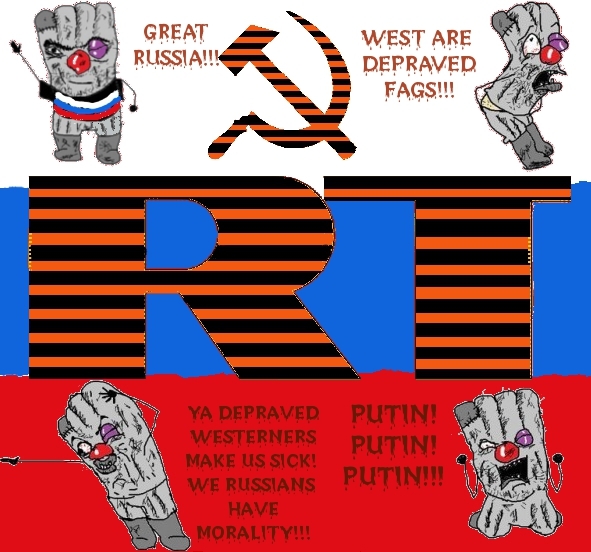 Even seeing the deep of stinky filth in front of them, russophiles will continue walking right into the abomination, drowning with joyful cheers – because their russian commie masters told them so. Neither education nor social status can guarantee a presence of elementary wits. Being at the top, one pitiful russophile is able to ruin a project of tremendous cost or turn it to enemy’s benefit. Such a thing happened with Eutelsat communications corporation. Most of the world doesn’t give a damn to their Internet until it goes down. Soon indifferent dummies will learn what “russian quality” means, as well as “russian privacy”. Henchmen in Eutelsat signed an agreement with red subhumans, according to which two new russian satellites (launches are planned at 2013, “Ekspress-AT2” and 2015, “Ekspress-AMU1”) will be included into global Eutelsat network for traffic capacity expansion. There is no need to explain separately how and why all the information transmitted through such network will be in dirty hands of neo-commie scum. 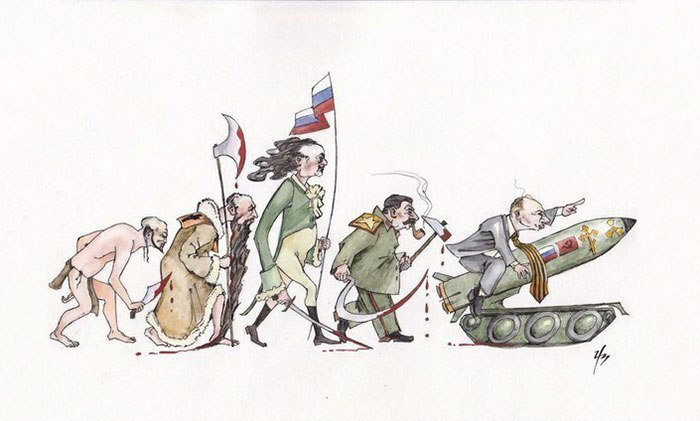 If results of russian intervention into communications can be revealed after some time, there are more near and far more evident results of so-called “cooperation” which are being ignored by russophiles who consider necessary logic a completely obsolete instrument of mind. Recently, Eutelsat dummies trusted to drunken red untermenschen to launch their own satellite on russian rocket “Zenith-3SL” from sea platform “Odyssey” in Pacific Ocean. Instead of blowing up or falling right at the launchpad (like HERE), the rocket even succeeded to go up and away a little, just to end the flight in big splash nearby. The satellite was lost for sure. Trying to toss the guilt at each other, eternal commies hastily begun to invent different nonsense excuses, from “ocean waves” to “foreign object in fuel system”. Trying to avoid scapegoat’s fate, groups of so-called engineers are challenging each other in skills of drivel. But even some of those russians are not refusing shameful reason of accident; “this is returning to 1957, when we just started to launch rockets” said Ivan Moiseev, a director of space politics organization. Nevertheless, loyal to their anti-logic, russophile dummies won’t take all this into consideration. Indeed, they will continue praising of their red idol even harder than before. Sources: Kavkaz Center, IPVnews, RBC. Even in the grimmest times there can be something to laugh at. 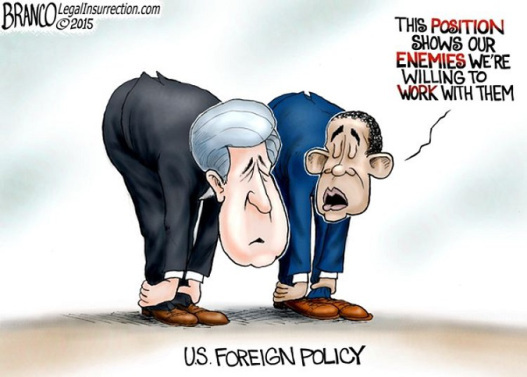 Especially when the enemy is russian subhuman, whose common activity can go further than the most ridiculous comedy. For russian slaves, their day of red rampage (as all other their UNHOLYdays) is a traditional reason to booze brains off. Being far from humanity and common sense even in rare moments of sobriety (if having any), after getting drunk with cheap vodka they can’t even distinguish their own soldiers from opponents. 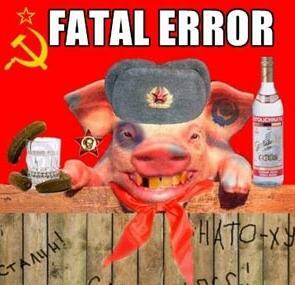 Modern neo-communists have an example to follow: their own untermensch ancestors made numerous “heroic” deeds at war, from drunk skirmishes between comrades and running over the most unfortunate of them in drunk tank joyride till wandering behind frontline in epic quest “vodka is never enough”, having a POW hangover afterwards. 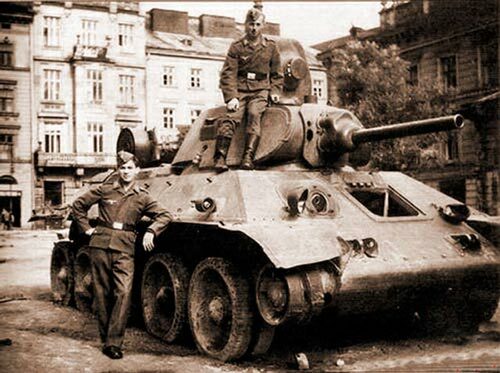 This is a wartime photo of German tank crew members posing with knocked-out soviet T-34. 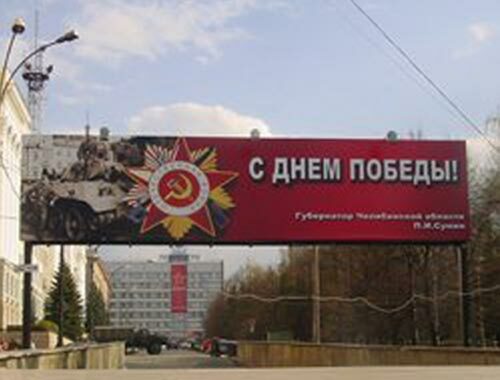 And here is modern russian poster with an attempt to glorify bolsheviks, by using the same image. 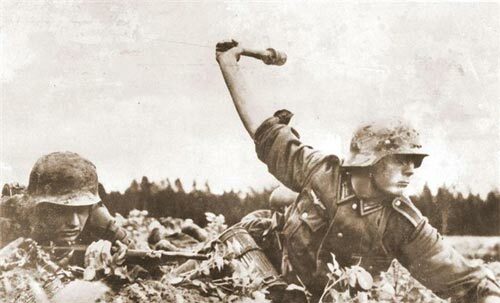 Wartime chronicles: A German soldier is about to blow up some russian asses. 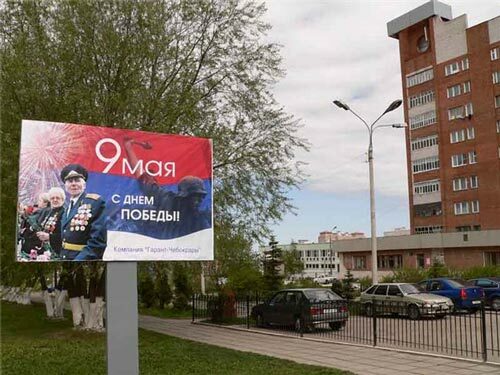 Another russian propaganda poster dedicated to veterans featuring this soldier on russian flag background. But russian veterans as well as their younger offspring don’t care about anything when they have vodka. Soon those bolshevist imbeciles will be mistaking Hakenkreuz for their subhuman sign of hammer and sickle.